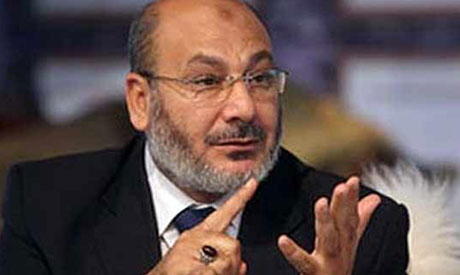 Islamist preacher and Muslim Brotherhood ally Safwat Hegazy has been acquitted for charges of 'inciting violence' at the Muslim Brotherhood headquarters on 30 June, which left eight dead. Hegazy, who was detained earlier in August, still faces a number of other charges, including incitement of 15 July clashes between supporters of ousted president Morsi and police forces in Ramsis Square, Downtown Cairo. He is being accused of 'inciting' the attempted storming of Al-Azbakeya police station, near Ramsis Square, as well as for targeting policemen with firearms. Hegazy also faces charges of 'attempted murder' and 'incitement of violence' against opponents of deposed president Mohamed Morsi within the pro-Morsi protest camps in Cairo's Rabaa Al-Adawiya Square and Giza’s Al-Nahda Square, as well as for his role in earlier clashes between supporters and opponents of Morsi at the Presidential Palace in December. we do jave a terrorist state on egypt. it is just like at the tim of Pharaoh. we have a dictator. he does what he wants to do. if he wanys to arrest someone he arrests. if he wants to free someone he can do it ( mubarak). He won't wiggle out of being found guilty of inciting violence at Rabaaa. We watched him on tv screaming his invictives at the crowd. He condoned violence and knew of the weapons, torture and killing going on behind the backs of the paid cheering crowds.